When it comes to the future of the UK job market, things are looking a little uncertain right now. Brexit is fast-approaching, and it has raised many questions about where we’re heading. For those starting out on their career path, this is an interesting time. Here at Rated People, we wanted to get an idea of the current mood among school leavers. So, we asked 2,000 British residents in full-time education, apprenticeships and work for their thoughts on their career. Our research revealed that going to university is still the most popular option after school, with almost 50% of 18 to 24-year olds making the decision to head there and continue studying. Studying the arts continues to be the most popular choice, with over a third of graduates having a Bachelor of Arts degree. It’s closely followed by the sciences, with almost a quarter (23%) studying for a Bachelor of Science degree. There’s also appetite for going straight into work, with almost one third (29%) of 18 to 24-year olds choosing to start learning on the job instead. While there’s value in both of these choices, there’s a third path that’s been gaining popularity – apprenticeships are fast becoming a go-to option for young people seeking a hands-on way of learning a trade from industry experts. 18% of 18 to 24-year olds begin their careers in an apprenticeship. Based on the latest figures by the government, 2018/19 is projected to show the highest number of apprenticeships starts for the past 5 years, with 29% more starters than 2017/18. While common with young people, we found that the second-highest number of apprentices were in the 65-and-over category (16%). While we tend to think of apprenticeships as a path for the young, it’s a path that’s also gaining interest with people who are considering a career change, after already working for several years. 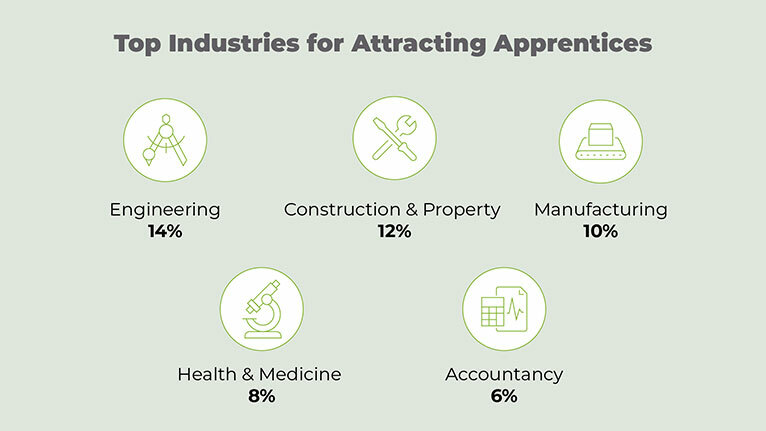 Engineering is the top industry when it comes to the spread of apprentices (14%). This is followed by construction and property (12%); manufacturing (10%); health and medicine (8%); and accountancy (6%). Using data from Total Jobs, we looked at the financial benefits of an apprenticeship compared with further education. The results make for an interesting read. In many industries, apprentices are financially better off than graduates. 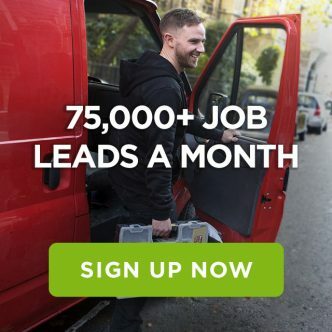 For example, the Total Jobs stats reveal that apprentices enjoy a starting salary that’s 14% higher than a graduate when joining an engineering, manufacturing or utilities apprenticeship. There’s a 21% jump in starting salary for those starting a construction apprenticeship, too. However, this isn’t the same for all industries, so some work is needed to level the playing field. Although early earning potential can be higher for apprentices in certain industries, paygrade data in the UK shows that graduates can earn more in the upper salary bands for those same industries. 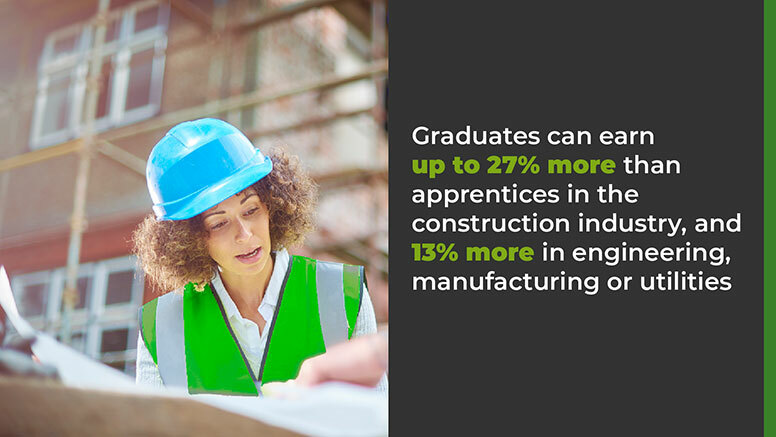 In the construction industry, graduates can earn 27% more than apprentices, and 13% more in engineering, manufacturing or utilities, despite the level of experience and knowledge for many former apprentices often being on par with that of a graduate. A person on an average salary wouldn’t notice a big difference however as the average salary equals out at £32,500 for both routes. This shows us that given the years it takes to reach the higher salary ranges in the current job market, starting off at a higher rate by going down the apprenticeship route would seem to be the best path for industries like construction and engineering, to ensure you earn more for longer. However, the difference from industry to industry and the difference between the earning potentials at the higher end, tell us that we need to look at rewarding workers for their skills, and see if there are valid reasons why apprentices aren’t reaching the higher salary range when graduates are. 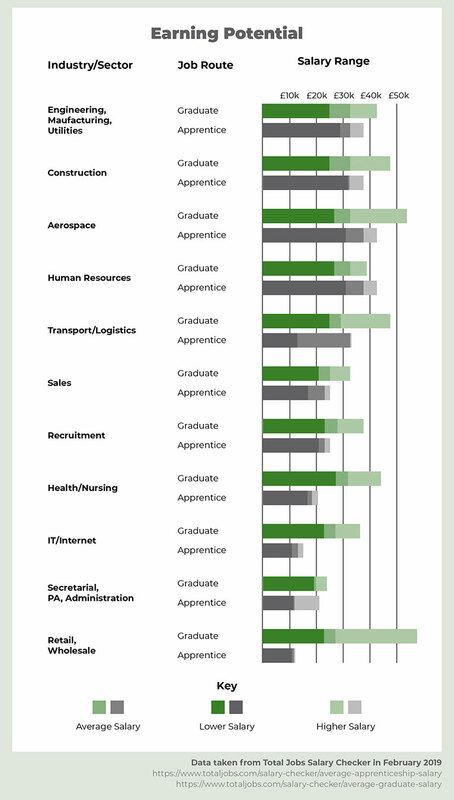 For example, are there any missing, or perceived missing, skill gaps that need to be worked into apprenticeship training? This needs to be addressed for apprenticeships to be a valued and appealing long-term option for school leavers. Perhaps one of the most notable things that emerged from the survey was the gender split across all post-school options. You’ll find the highest number of UK apprentices in Sheffield and Edinburgh. Men are more likely to take up an apprenticeship than women, with 15% opting for this route. This is more than double the 7% of female apprentices. This theme continues as we drill down into the data from our survey, with almost four times as many male (12%) than female (5%) apprentices in the engineering sector. The same is true for the manufacturing sector, with an 18% vs. 5% split. Within property and construction, there are 16% male, versus 9% of female apprentices. 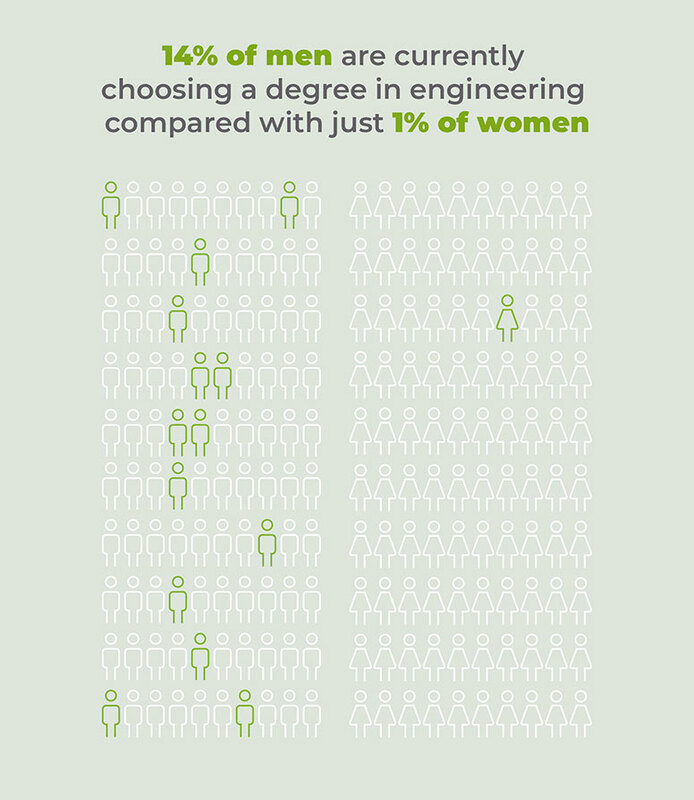 Medicine and health, however, sees a change in shift, where more women (16%) than men (3%) are apprentices. This shows us that there is a visible split in certain subject areas. The likes of manufacturing, engineering and property are all heavily male-dominated subjects, yet medicine and health are areas that more populated by women. The construction and property sector has seen a surge in apprenticeships among younger people. Over a third of 18 to 24-year-old apprentices take up roles in this area. This rises to 40% among 25 to 34-year-olds. Interestingly, when it comes to motoring and automotive apprenticeships, Cardiff attracts the highest numbers. When it comes to going from the schoolroom to the workplace, the admin, secretarial and PA industry attracts the most school leavers, with 17% heading straight into this sector. This is followed by retail (11%), banking (8%), and engineering and manufacturing (6% each). Twice as many women (10%) are going into banking after school than men (5%), and almost twice as many women are joining the admin industry (21% compared with 12% of men). Overall, women are also more likely than men to head straight into work, with 57% selecting this route compared with 50% of men. The gender split is there for those entering higher education too, as despite a huge push recently to attract women to STEM subjects, engineering continues to be male-dominated. Our survey revealed that 14% of men are choosing a degree in this field, compared with just 1% of women. There’s an interesting shift when we look at the number of women going onto business courses, however. Women (14%) are more likely to enrol onto a Bachelor of Business Administration degree than men (just 3%). It’s positive that apprenticeships are becoming a much more popular option for school leavers, however the university route still reigns supreme as the most popular choice. As it currently stands, 18% of 18 to 24-year-olds are now beginning their careers in an apprenticeship. The latest figures released by the government highlight that 2018/19 is projected to show the highest number of apprenticeships starts for the past 5 years, with 29% more starters than 2017/18. The largest growth is projected to be for under 19s, with a 42% jump in that age group starting apprenticeships. Going forward, with an ever-expanding range of apprenticeships becoming more readily available, we’re hopeful that the number of people opting to go down this route will increase at a much faster rate. However, for apprenticeships to get the boost they need, the earning potentials need to become a level playing field across industries. We also need to look into the reasons behind the differences in graduate versus apprenticeship salary to ensure we’re rewarding workers appropriately for their skills. Once this happens, school leavers facing a post-Brexit future could find that apprenticeships would be a worthwhile option long term, regardless of the industry they’re interested in.